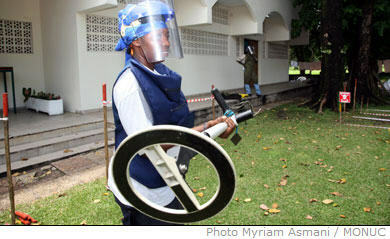 World Mine Action day was celebrated in Kinshasa on Wednesday April 4 2007. Many speakers explained the dangers that anti personnel mines and unexploded ordnance (UXO) pose to the Congolese population and the development of the country, as well as underlining the challenges that lie ahead in this fight in the DRC. Landmines and UXO remain in the ground and continue to maim and kill indiscriminately, many years after armed conflict, and DRC is one of 84 affected countries worldwide, claiming some 20,000 victims each year. The assistance given to the DRC government by donors such as Holland and others, as well as by MONUC, UN agencies and international and national NGO’s is essential in this fight, and focuses on three main areas - de-mining, sensibilisation of the dangers of landmines and assistance to victims. De-mining in the DRC - carried out by Mechem, MAG and others - is extremely expensive and time consuming work, particularly as infrastructure is nonexistent and transport extremely difficult in many parts of the country. Sensibilisation and assistance to victims forms part of the important work of organizations such as the Red Cross and Handicap International are involved in. Mr. Max Hadorn of the International Red Cross said two important issues need to be addressed in the fight against landmines in the DRC. “Firstly, the government needs to have national legislation on this matter, and assistance to victims is insufficient, I hope this event will keep the focus on this problem that affects thousands of Congolese,” he said. The Red Cross runs five centres of assistance to victims of mines in the DRC- two in Kinshasa, as well as Goma Bukavu and Mbuji Mai. Mr. Andre Dellevoet of the Dutch embassy, who are one of the main donors in the fight against mines in the DRC, said that mines and UXO continue to kill and maim indiscriminately. Mr. Ross Mountain, UN Deputy Special Representative to the Secretary General in the DRC, said that as a signatory to the Ottawa treaty in 2002, the DRC government has a responsibility in the fight. Following the Kinshasa conflict of March 22 to 24 last, over 20 UXO’s were found in the city, particularly in the central Gombe district, and Mechem and others are still evaluating and tackling this problem in the capital.